Theater for kids and families. Recommended for children from 0 up to 9 years old. We would like to welcome you and invite you to participate in our adventure. 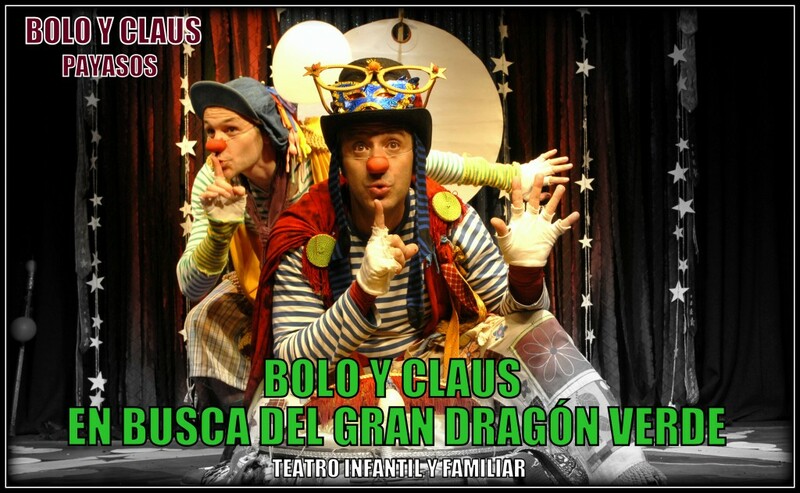 Bolo and Claus travel around the universe in search of the Green Dragon. He is the guardian of a treasure. A treasure of candies, chocolates, ice cream, lollipops and cookies that he’d like to share with his friends. The Dragon is very shy and that’s why he is not easy to reach. Some people say that he lives inside of an egg. To find him we will travel around the planet earth, we will sail the oceans and cross the continents until we get to a mysterious island, where many creatures live. Creatures such as elves, monsters, fairies and even a witch. At night and after finding the egg, we’ll run into some problems that we will finally solve by telling a beautiful story. The story of the Moon and the Stars. The next morning, the Green Dragon emerges from its egg to share some of his treasures with his new friends. But before that, he will challenge us with some tests and he will ask us to follow some trails that will lead towards one of his many treasures. We always find it and it’s always a surprise! The length of the show is about 50 minutes. The verbal language used in the show is clear and simple, with a direct and comprehensible structure. The visual and body language are two aspects of this creation that are developed in depth and used as expression tools. The evolution of the characters themselves and their conflicts are structured and developed from a perspective, comprehension level, attention and interests of a little child. The action occurs inside a universe where music, magic, puppets, stories and games are the main ingredients, transforming this experience into an incredible fun adventure and at the same time into a show of artistic and pedagogical interest. The show will adapt to different type spaces like school rooms, dining halls, gyms, playgrounds, parks, auditoriums or theatre stages.